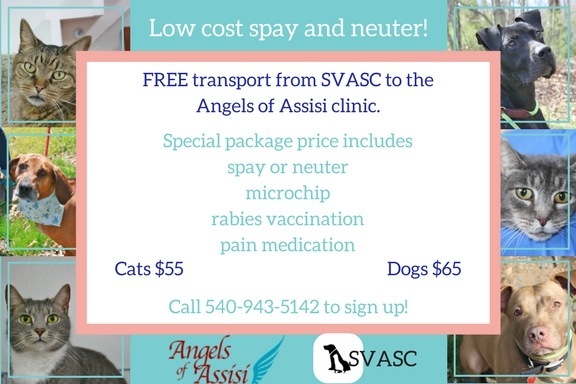 Connect with Shenandoah Valley Animal services on social media! Stay up-to-date on events, get involved, and meet our amazing animals! SVASC has several wonderful dogs waiting for their forever homes in foster care. Many have been waiting for homes for months and even years for some. Fostering is awesome and it gets dogs out of the shelter environment, frees up a kennel for another dog, and gets the dog prepared for life as a family member. Foster homes are not meant to be a long term solution though and these dogs still need adoptive homes. This may be a long shot, but we're going to try! If anyone has been missing a cat in the W Johnson St area in Staunton in the last 2-4 months that looks like this kitty - he may belong to you! A family had taken this cat in when they moved to the area, assuming he was a stray - they even named him "Baby" because they thought the cat was a female - it is not! "Baby" is a young, neutered male! PLEASE help us by SHARING in hopes that someone will claim him - someone took the time to neuter him, so maybe they haven't given up and are still looking for him! Cheeto is looking for a home where he can be king! He doesn't seem to be too fond of other animals here at the shelter, but that may change once he's settled into a home. We haven't seen his interaction with children so we would recommend bringing any kiddos to visit before bringing him home. Cheeto is neutered, current on vaccinations and ready to win you over - come on down to meet him today! We are open until 4pm.